A few years ago brining was all the rage. I did it occasionally. I haven’t seen or heard much about it lately so I have no idea if it’s still popular. I still do it occasionally. I never was much for following the trends…. If you follow this blog you will have figured out that we normally have a first course as well as a main course on the weekends. We both like this as it makes for a more relaxed dinner and first courses are usually fun. And the pace makes us less apt to eat too much…. a side benefit. The reason I’m telling you this is that we have discovered that 1 Cornish hen is really enough for the two of us. Yes, we could and would eat more when I make two…. But I am now in the habit of putting the second one in the fridge for lunch the next day…. Another side benefit. 2 Cornish game hens or little chickens, depending on size. Add garlic, bay leaves and juniper berries. Add ice and hens, making certain that the hens are covered as best you can. 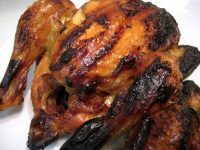 They tend to float…..
Cook hens on barbecue grill over indirect heat (either charcoal or gas), covered, for 45 – 60 minutes, depending on size, or until done. Or they can be baked in a shallow roasting pan in a 400F oven for 45 – 60 minutes, until done. If baking, start basting immediately. Schadenfreude: The feeling of pleasure one has at the misfortune of others. It could be as benign as a bit of glee when the boorish person next to you in a restaurant spills wine on themselves to the urge to applaud when your cheating in-law is outed on Facebook. I should be experiencing schadenfreude. Is there a word for a feeling of sadness when a desired result is finally achieved? Our little neighborhood has experienced mass bunnycide. We have had far too many rabbits.They damaged my gardens, the farmers fields and were generally pesky, invasive little devils. They burrowed under our fig tree causing it to fall, almost on my head. They dig everywhere and anywhere just for giggles. We have to have fences around anything we want to grow. Normally, on our morning walk (the dogs and I) see 20 or 30 cute little bunnies of all sizes and ages. This morning there were none. Yesterday, our neighbor at the entrance to our lane, who owns the field across from us where most of the rabbits have been happily living, unmolested, for the past 8 years, decided it was time to mow. Because the field had been neglected for those past 8 years she had to hire the big equipment to come in and do the job. The last time I looked out the door I saw a few rabbits frantically trying to hide in the last remaining strip of weeds as the big mower bore down on them. Perhaps they have all moved on. Or maybe they’re hiding in their burrows, too traumatized to come out yet. Maybe we all, neighbors, farmers, everyone living near here, Including me, have gotten our collective wish and the rabbits are gone. So why do I feel sad? Like you, we share a Cornish hen – it’s plenty! I guess anyone would be sad at the wholesale slaughter of any species, even a pesky one. Never fear, some will have survived to bedevil you, or bunnies from afar will migrate in with time. You will live to curse them again! They survived – and moved closer to the house. Divine rabbit retribution! They are just lying low, waiting to reveal their little lapin faces when the coast is fully clear !!! Kate, that’s exactly what happened!